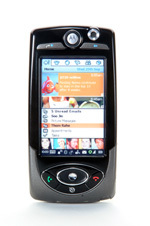 3 UK today announced the availability of three new 3G mobile phones from Motorola. The phones are: * Motorola E1000 - 260K color display, 1.2 megapixel camera with 8x zoom, QVGA resolution display, Bluetooth * Motorola A1000 - Symbian based, 2.9 inch 65K color display, 1.2 megapixel camera, Bluetooth, very small size for 3G phone * Motorola C975 - 1.9 inch color display, VGA camera with 4x zoom, video streaming, capture, download and playback. The Motorola A1000 is shown at right.